We’d love your help. Let us know what’s wrong with this preview of When the Facts Change by Tony Judt. To ask other readers questions about When the Facts Change, please sign up. I won this book and never got it in the mail. Did you send it out yet? I won this book in a giveaway but never got it in the mail what should I do? Every time I read his essays and book reviews, I mourn the loss of Tony Judt. This volume contains around 30 essays comprising book reviews, commemorative essays, and even some drafts of a proposed book about trains. They cover topics ranging from the Iraq War to the future of the welfare state to the dangers of over reliance on economic ideologies in politics to a bunch of other topics. These essays are short, well written, and highly literate. Judt was widely read in topics that most of us wil Every time I read his essays and book reviews, I mourn the loss of Tony Judt. This volume contains around 30 essays comprising book reviews, commemorative essays, and even some drafts of a proposed book about trains. They cover topics ranging from the Iraq War to the future of the welfare state to the dangers of over reliance on economic ideologies in politics to a bunch of other topics. These essays are short, well written, and highly literate. Judt was widely read in topics that most of us will never go into deeply (Eastern European intellectual history, for example). He is deeply intellectual and critical. His book reviews take apart the works of major scholars with a thoroughness that makes me envious. (Look at the review of Norman Davies book on Europe as an example). The title of the book comes from Judt's fondness for the quote attributed to Keynes that "When the facts change, I change my thinking -- What do you do sir? These essays show how his thought adapts to the change in the world after 1989 and up through the post 9/11 era. Judt's essays are also courageous. His is not afraid to debunk established truths and draw conclusions that are nearly obvious but not politically correct. These are honest essays with little posturing. This forthcoming, posthumous collection of essays from historian Tony Judt encapsulates his breath of knowledge, including European history and current affairs, Zionism and the Israeli-Palestinian conflict, and the Iraq War, though he veers off track with his social democratic criticism of the United States economy. The essays include a few obits and several of his reviews from the New York Review of Books, all of which I enjoyed. He says, "Trains are about moving people." In the United States, t This forthcoming, posthumous collection of essays from historian Tony Judt encapsulates his breath of knowledge, including European history and current affairs, Zionism and the Israeli-Palestinian conflict, and the Iraq War, though he veers off track with his social democratic criticism of the United States economy. The essays include a few obits and several of his reviews from the New York Review of Books, all of which I enjoyed. Judt states the US railroad industry was effectively nationalized in the 1970's. That is very incorrect. Passenger rail was effectively nationalized via Amtrak and a handful of bankrupt freight carriers were nationalized as Conrail. The larger rail companies survived as private companies. He questions "the logic of the suburb" because of high oil costs. As I write this, gasoline is back down to $2 per gallon, powered by new exploration technologies (deep sea & fracking) and more efficient cars. The growth trajectory of electric and hybrid cars may, at least partly, decouple suburban transportation from oil. On economics, Judt didn't like Thatcherism or the Reagan-Clinton years, stating, "regulatory structures set in place over the course of a century or more were dismantled within a few years." In several places he implies regulation simply vanished. That was not the case. In the 1980s and 1990s in the USA, the rate of growth in regulation slowed, which is shown in the link http://fas.org/sgp/crs/misc/R43056.pdf. For example, in the last year of the Carter presidency, 1980, 7,745 final rule documents were published in the federal Register and the number of new final rules dropped to 4,581 by 1987. Judt mistook Thatcher-Reagan era rhetoric for reality. Reagan promised to eliminate cabinet positions but ended up adding a few. The Reagan years saw deregulation of certain industries, several of which, railroads and air travel, were very successful. What Judt probably refers to is financial regulation, especially in the later part of the Clinton presidency. That said, the parts of the financial sector that caused the 2008 financial crash were among the most regulated (mortgages at commercial banks). He may confuse badly executed regulation with the absence of regulation. I found this work the most disappointing in its sections on social democracy and his criticism of social policy in the USA. He was offended by the Clinton welfare reform because means-tested charity/government programs are "notoriously humiliating." If so, what is the problem? To me, welfare should be a safety net, not a permanent blanket, something that keeps people from starving, provides the unemployed with basic medical care, etc. I would hope people would never get comfortable with being on the dole. Judt dislikes "workfare" or even the idea that the able-bodied should work. He comes from a social democratic tradition that believes people, by their mere existence, have the right to be taken care of by society, whether they want to work or not. Very telling was his criticism of Clinton's reform that people "must first have sought and, where applicable, secured employment at whatever wage is on offer, however low the pay and distasteful the work." That is an incredible statement; if you don't find a job that meets your personal expectations, take welfare instead. Judt is silent on those "distasteful" jobs. In his ideal world, no one needs to work as, say, a busser, maid, or farmhand, because of the low pay and "distasteful" conditions. Then, I ask, who will do that work? In fact, if he saw the big picture, he would understand what center-Left pols like Tony Blair realized, specifically that the best way to achieve a solvent safety net is by carefully managing its costs. Judt also is philosophically opposed to privatization. He celebrates "big government" as such. Yet, many Western countries have successfully experimented with privatizing certain services. Judt is correct that there are some functions (e.g. fire and police) that simply cannot be privatized, yet, he mentions coal mines and postal delivery (is he familiar with FedEx and UPS?). I think he is far too rigid in ideology here. Let municipalities (like Chicago), states, and nations experiment and find where privatization makes sense. It is not an "all or nothing" proposition. Even in areas where I disagree with Judt, his writing is clear and each section includes footnotes. His foreign policy positions are almost always reasonable. His knowledge of history is deep and his perspectives on Israel and Palestine are well-considered views that everyone should consider. He is Jewish, but opposes Israeli settlements. He has interesting things to say about militarism, and rightly points out the United States had a singular experience of low casualties coupled with WWI and WWII success that makes Americans more amenable to war than Chinese, Russians, Japanese and Europeans who were devastated by those same wars. He points out that, if you ignore the experiences of small wars like Vietnam, the United States has never been defeated. Not since the American Civil War has blood been spilled on continental US soil. His book reviews, particularly of Camus's The Plague and his blistering attack of Norman Davies's Europe were excellent. This was an Advance Reader Copy won through a GoodReads give-away, and I trust the typos will be corrected in the final book published in January 2015. I find it fascinating to compare Judt with another British-born Jewish scholar and historian of Europe, also educated at Cambridge, Simon Schama. I’m reading his 2010 essay collection, Scribble, Scribble, Scribble. Since they are the same generation, Judt and Schama must have been acutely aware of each other, but I find little evidence that they met very often, much less became friends. Perhaps it’s just as well: they are very different personalities, each with a brilliance and erudition that the other may have experienced as a succession of sharp elbows. Judt can be an entertaining writer, but it is the rigor and clarity of his arguments that strikes a reader like me so forcefully. Homans reveals one of his secrets in her introduction: deep reading (no surprise) supplemented by an elaborate system of note taking and outlining. Judt writes on many topics here – his love of railroads, for instance – but he doesn’t range as far afield as Schama in his topics. Judt is always disciplined in his focus and penetrating analysis, Schama more sprawling and ecumenical. The only drawback to Judt’s collection is its timing. Many of these essays on foreign policy and the contrasts between Europe and America (a perennial subject) were written in the early 2000s, when the Bush administration squandered the world’s goodwill following 9/11 with its harsh unilateralism and the disastrous Iraq war. Judt’s responses here are more in sorrow than anger, but he is utterly ruthless in his dissection of America’s failures and delusions – as he is of Israel’s and Europe’s too, for that matter. As a result, I found most enjoyable the essays not explicitly linked to contemporary events. One is on Albert Camus, perhaps Judt’s greatest hero – and it shows. The essay concerns Camus’s 1947 novel, The Plague, less celebrated than The Stranger perhaps, but a greater book in Judt’s view. On one level, The Plague is a loose allegory of Vichy France and the accommodations that people must make in the face of evil. But it is also a profound meditation on the “absurdity” of the human condition that implicitly rejects the callous political classifications of “right” and “left” that so preoccupied his contemporaries such as Jean Paul Sartre and Simone de Beauvoir. Indeed, Camus was heavily criticized for not being “political” enough in this and other works, leading to his break with much of the French intellectual world, still in thrall to the dream of Marxism. Judt’s other great theme here is the loss of communal responsibility and a skepticism about the importance of the public sphere, exemplified in the rise of politicians like Margaret Thatcher and Ronald Reagan. The collective abandonment of the institutions and values built so painfully by social democracies over generations amounts to an irreparable loss, he argues, one that leaves isolated individuals facing the uncaring power of modern corporate capitalism. This is especially the case in the United States, with its emphasis on hyper-individualism, unchecked free markets, and demonization of government. Could it be? A book that is precisely the sum of its parts, neither more nor less? Facts collects a bunch of book reviews and short essays, mostly written for the usual suspects (NYRB). Most of them are solid. A few are great. A few don't really bear re-reading. The most fun are the straight book reviews, all from before 9/11 and the invasion of Iraq. Judt destroys Norman Davies and other writers on Eastern Europe; fans of the take-down will enjoy that. The most relevant are the pieces that lead Could it be? A book that is precisely the sum of its parts, neither more nor less? Facts collects a bunch of book reviews and short essays, mostly written for the usual suspects (NYRB). Most of them are solid. A few are great. A few don't really bear re-reading. The most fun are the straight book reviews, all from before 9/11 and the invasion of Iraq. Judt destroys Norman Davies and other writers on Eastern Europe; fans of the take-down will enjoy that. The most relevant are the pieces that lead up to Judt's defense of social democracy, including the pooterish essays on trains, and 'What is Living and What is Dead in Social Democracy,' which is a nice, short version of Ill Fares the Land. In between are two sections sure to upset most people. Judt's writings on Israel and Palestine are fascinating, and perhaps the only example in this volume of Judt actually changing his mind when the facts change. They're also sure to enrage the pro-Israel types so common in the U.S., and probably some pro-Palestinians as well. His writings on the 'war on terror' and the Bush II presidency should upset everyone, because the whole thing was such a waste of breath, and he could have been writing about something else. A friend of mine says that the invasion of Iraq might be the only event of our lifetime in which his original, gut-level, unjustified moral and intellectual response is identical with his later, hindsight-informed, 'objective' moral and intellectual response, and that seems right. It was transparently a stupid thing to do, and an immoral thing to do, and spending hundreds of NYRB pages reviewing books saying either that or the opposite was a waste of time. Granted, people did need to be making the moral points. But reading them now is dreary to say the least. Szkoda, że Judt nie zdążył napisać pracy dotyczącej rozwoju naszej historii przez pryzmat lokomocji. Doskonały zbiór esejów z ostatnich 25 lat twórczości od problematyki ONZ, po wspomnienie Leszka Kołakowskiego. 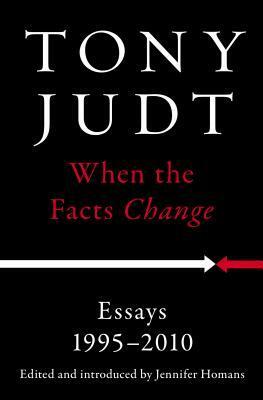 Tony Judt’s last collection of essays, entitled, When the Facts Change, reminds us how much we lost when he died in 2010. Most of these essays were published in the New York Review of Books. As a regular reader of that publication for more than 40 years, I had read them all when they first appeared. Nonetheless Judt astonished me a second time with his erudition and intellectual versatility. Jennifer Homans, Judt’s widow, provides an insightful preface documenting how hard Judt worked on his cont Tony Judt’s last collection of essays, entitled, When the Facts Change, reminds us how much we lost when he died in 2010. Most of these essays were published in the New York Review of Books. As a regular reader of that publication for more than 40 years, I had read them all when they first appeared. Nonetheless Judt astonished me a second time with his erudition and intellectual versatility. Jennifer Homans, Judt’s widow, provides an insightful preface documenting how hard Judt worked on his contributions to the NYRB. He took extensive notes on everything he read, drafted an outline, and then inserted his notes and additional thoughts in an arduous process of research, planning and drafting. I don't know how such well-informed essays could be written any other way. These pieces flow well, but they are not stream-of-consciousness; they are a stream of conscience, if they are any kind of stream at all. There are a number of very sad observations in this collection, none sadder than those which document Judt’s deepening disenchantment with the politics and policies of Israel. As a Jew and an historian of Europe, he might have expected better than a state determined to “secure” itself at a cost betraying its human values and tragic experience. Over the years, Judt lost hope even in the prospects of a “two-state solution” as Israel gnawed away at the land Palestinians would need to create a state with their massive settlements and aggressive policies in the West Bank and Jerusalem. Six years after Judt’s death, things have only gotten worse, a fact somewhat obscured by the collapse and chaos that has beset the rest of the region. Judt was disheartened by George W. Bush’s negligent support of Israel’s intransigence and deeply disappointed by Barack Obama’s half-hearted efforts to force Israel to call a halt to the settlements and engage in some form of serious peace talks. He was eloquent in pointing out that the demographics of Palestine, absent a two-state solution, could (and can) only lead to an apartheid state, with Jews ruling the Palestinians who at some point will outnumber the Jews under their direct or indirect rule. Not a good prospect. One of the best essays in this collection focuses on why the U.S. has never succumbed to the allure of social democracy. The problem, in a nutshell, is twofold: Americans are not homogeneous enough to trust and support one another and Americans have permitted the economic paradigm to overshadow the political paradigm. We subordinate our political interests to the economy, not vice versa. I suspect Judt would have supported Bernie Sanders in the 2016 Democratic primary campaign, because this is what Sanders pointed out. There a few odd pieces in this collection that reflect Judt’s affection for railroads, not merely aesthetically but politically. Along with sociologist Richard Sennett, Judt believed that sharing common spaces across class lines increases a sense of community. Sennett’s favorite example was the 18th century public house in England. Judt’s was trains, wherever they might run. In this collection we see Judt predict growing economic inequality in the U.S., more terrorism (not a new phenomenon), and a difficult period of slow growth. He was right. The Trump phenomenon, a backlash built on resentment and fantasy, would not have surprised him. European and world history is littered with the political carcasses of authoritarian narcissists; the problem is that doing away with Trump (as of August 15, 2016, he is pretty well dead in the water) will not do away with the problems he has tried to exploit to his own advantage. We could use Judt’s thoughts on this. How are we going to persuade ourselves that politics should define economics, and not the other way around? Tony Judt is wise, widely-read, measured, cosmopolitan, patient, and literary. Qualities that made Judt a respectable public intellectual in the previous generation, these characteristics would now make him tiresome to readers of our current moment. Social media places a premium on other qualities: irony, sass, confidence, sarcasm, and perhaps most of all, cleverness that can produce snappy memes. The death of public intellectuals, as we know them, is due not only to the structural reasons that s Tony Judt is wise, widely-read, measured, cosmopolitan, patient, and literary. Qualities that made Judt a respectable public intellectual in the previous generation, these characteristics would now make him tiresome to readers of our current moment. Social media places a premium on other qualities: irony, sass, confidence, sarcasm, and perhaps most of all, cleverness that can produce snappy memes. The death of public intellectuals, as we know them, is due not only to the structural reasons that someone like George Scialabba identifies. There are stylistic causes too. The essay no longer has much of an audience. Social media is the dominant medium, with stylistic constraints of immediacy, speed and brevity. It seems that these demanding qualities would foreclose the possibility for would-be commentators who would resemble Judt. What does a 21st century public intellectual resemble? It’s not surprising that an old-fashioned, wannabe leftist intellectual like myself would be drawn to a writer like Judt. His writing is superb and his analysis is clear and persuasive. His privileging of “the facts” make him an attractive resource. But who seeks to use such a resource? Judt draws his title from a quote by someone who passed away in 1946, the year that my 70-year old father was born. Reflecting on the last several presidential campaigns, facts are wholly irrelevant to how people make political judgments. It took me a crashing long time to finish this book, not because it's hard to read, but because it consists of 29 essays, which would be highly punishing to read one after the other without pause. Tony Judt has raised my understanding of modern history (i.e. late 19th century forward) than any other historian (directly) or fiction/non-fiction writer (indirectly). I now have a real feeling for the flow of the times which I didn't have when I was living the part of them post-1947. My only difficulty It took me a crashing long time to finish this book, not because it's hard to read, but because it consists of 29 essays, which would be highly punishing to read one after the other without pause. facts. essays and facts. essays and facts that make the reader think. I wonder what Mr. Judt would have made of this moment in history: Brexit, Trump, Le Penn, etc. The liberal world order for which he so passionately argues is crumbling. Mr. Judt is a communitarian, a EU apologist (in the best sense of the word) and committed to a globalism that is being rejected at a startling rate. The essays in this volume are well written and insightful. However, Mr. Judt is blind to the criticisms of his globalist, liberal agenda that have only strengthened after his death. P I wonder what Mr. Judt would have made of this moment in history: Brexit, Trump, Le Penn, etc. The liberal world order for which he so passionately argues is crumbling. Mr. Judt is a communitarian, a EU apologist (in the best sense of the word) and committed to a globalism that is being rejected at a startling rate. The essays in this volume are well written and insightful. However, Mr. Judt is blind to the criticisms of his globalist, liberal agenda that have only strengthened after his death. People have more influence and control over local levels of government. As political groupings become larger, they become less subject to individual control and more subject to elite control. Institutions seem to feel less and less personal and relevant as they get larger. The EU super state reflects this paradox in spades. While Mr. Judt lauds the EUs ability to control local prejudices with a universalist human rights perspective, he ignores that most people feel controlled by, an unable to control, a gigantic bureaucracy that inserts itself into the smallest details of daily life. Mr. Judt's essays brilliantly express the promise of a liberal, global world order while remaining deaf to its practical implementation. Like all good academics, Israel comes in for special criticism as the antithesis of the communitarian view. Mr. Judt offers no real solutions nor any reason why Israel should be subject to any more criticism than the myriad of other rights abusers. In particular, Mr. Judt ignores completely the rejection of the universal values he holds so dear by the nations opposing Israel, including Palestine. Does Mr. Judt condone the treatment of women, LGBT and other religions by the Arab states? Why does he not feel similar opprobrium for the ethnic cleansing of Jews in North Africa and the Middle East in the 20th century? Where does he want the Jews in Israel to go? Why are Palestinians entitled to a right of return to Israel, but Germans don't have a similar right to East Prussia or the Sudetenland? An exceptional read looking back at where history was going. Judt is prescient about weaknesses in European politics and the structure of the EU, and on the huge challenges facing Israel given demographics and its lack of high-quality politicians. 10-20 years on, his essays seem far ahead of their time. His writings on the US are less strong (unipolarity around a liberal hegemon is looking pretty good right now), but still represent a good insight on where left-wing thinking was in the 1990s/200 An exceptional read looking back at where history was going. Judt is prescient about weaknesses in European politics and the structure of the EU, and on the huge challenges facing Israel given demographics and its lack of high-quality politicians. 10-20 years on, his essays seem far ahead of their time. His writings on the US are less strong (unipolarity around a liberal hegemon is looking pretty good right now), but still represent a good insight on where left-wing thinking was in the 1990s/2000s. "This subject brings me to that vilest offspring of the herd mind -- the odious militia. The man who enjoys marching in line and file to the strains of music falls below my contempt; he received his great brain by mistake -- the spinal cord would have been amply sufficient. This heroism at command, this senseless violence, this accursed bombast of patriotism -- how intensely I des Great essays! Highly recommended. "This subject brings me to that vilest offspring of the herd mind -- the odious militia. The man who enjoys marching in line and file to the strains of music falls below my contempt; he received his great brain by mistake -- the spinal cord would have been amply sufficient. This heroism at command, this senseless violence, this accursed bombast of patriotism -- how intensely I despise them! War is low and despicable, and I had rather be smitten to shreds than participate in such doings. These essays are a joy to read. They cover a wide range of topics, yet each is addressed with clarity and precision. These are examples of a master craftsman at work. Many of the subjects are familiar from Judt's other works, but some how this collection explores them in a fresh and interesting fashion. The collection just works well, and brings the many facets and scope of Professors Judt's preoccupations. Congratulations to Jennifer Homans for putting them all together. This is truly a fitting These essays are a joy to read. They cover a wide range of topics, yet each is addressed with clarity and precision. These are examples of a master craftsman at work. It has taken me a long time to finish this collection of essays, but not because they're poorly thought out or ill-written. Rather, the insight Judt shows is yet more depressing now - in the beginning of the third year of the Trump administration - than when I began reading it. One thing that struck me was the continuity of Trump's "foreign policy" with George W. Bush, something that's easy to miss right now; Trump may not be interesting in assembling a "coalition of the willing," but the aliena It has taken me a long time to finish this collection of essays, but not because they're poorly thought out or ill-written. Rather, the insight Judt shows is yet more depressing now - in the beginning of the third year of the Trump administration - than when I began reading it. One thing that struck me was the continuity of Trump's "foreign policy" with George W. Bush, something that's easy to miss right now; Trump may not be interesting in assembling a "coalition of the willing," but the alienation of our allies was already there. I am an abashed of Tony Judt. This collection of essays which covers a lot of ground is worth anyone's time. Essays are just the sort of thing you can read when you a bit of time to spare. Tony Judt is a master essay writer & each one of these finely crafted pieces has something worth saying & thinking about. Tony Judt is een intellectueel die ik had willen zijn. Ongemeen helder zijn zijn essays (dus ze zullen nooit het woord "zijn" twee keer achter elkaar zetten). Iedereen die ook maar iets wil begrijpen van de twintigste eeuw en de gevolgen voor de 21e moet dit lezen. Some of these essays were difficult to get through, others were fascinating and full of poignant takes on events and trajectories of the world. It is difficult, if not impossible, to read this posthumous collection of essays by renowned historian Tony Judt without experiencing a notable sense of remorse. I’m referring not only to a specific feeling of sadness over Judt’s untimely death from ALS in 2010, but to a more general feeling of regret over what we, his readers, have lost with his passing. For these essays – most of which first appeared in the pages of The New York Review of Books during the years 1995-2010 – attest to a clarity It is difficult, if not impossible, to read this posthumous collection of essays by renowned historian Tony Judt without experiencing a notable sense of remorse. I’m referring not only to a specific feeling of sadness over Judt’s untimely death from ALS in 2010, but to a more general feeling of regret over what we, his readers, have lost with his passing. For these essays – most of which first appeared in the pages of The New York Review of Books during the years 1995-2010 – attest to a clarity of mind and a breadth of knowledge that was unique to its time, and sorely absent but so desperately needed in our current and very trying times. Admirably edited, and featuring a superbly written and touchingly intimate introduction, by his widow Jennifer Homans, the book is organized into five thematic topics that form a perfect arc. The essays in the opening section focus on the struggles of Europe, and particularly the countries of Eastern Europe, to come to grips with the new political and economic realities of the post-cold war period – efforts that by and large were of remote concern and little interest to most Americans. The second section’s selections amp up our interest, as they concern the state of the Israeli-Palestinian conflict at the turn of the century, a matter of much more relevance to the United States. In the third section, the book’s midpoint, the arc reaches its summit, as Judt zeroes in on America post-9/11. The arc then begins its slow descent, though our interest never truly wanes, in the final two sections, which feature three last articles, a lecture, a dialogue between the author and his teenage son – each in some way concerned with the state of the country in 2010 – followed by obituaries Judt published in remembrance of three of his intellectual heroes, all of them little-known and under-appreciated international scholars – one from France, another from Israel, and the last from Poland. "Fear is reemergng as an active ingredient of political life in Western democracies. Fear of terrorism, of course; but also, and perhaps more insidiously, fear of the uncontrollable speed of change, fear of the loss of employment, fear of losing ground to others in an increasingly unequal distribution of resources, fear of losing control of the circumstances and routines of one’s daily life. And, perhaps above all, fear that it is not just we who can no longer shape our lives but that those in authority have lost control as well, to forces beyond our reach." To my knowledge, no contemporary commentator in 2016 has so eloquently and so accurately captured the underlying roots of the strange and scary phenomena Americans are witnessing in the nominating contests being waged in both major political parties at this stage of the 2016 presidential election campaign. In the absence of Tony Judt’s keen analytic mind shining its light on what is happening today, we can at least, with great gratitude tinged with that lingering sense of remorse, avail ourselves of his penetrating insights into what was happening just a few short years ago. I have not always been a fan of Judt's politics. The 'fidelity to facts' is a classic right-wing trope against the 'ideological' interpretations of left historians. There is some of that here as well, but interestingly, Judt is at his best as a critic. The utter demolition of Norman Davies' Europe: A History is simply the most enjoyable book review I have ever read. Judt is extremely solid on Israel/Palestine (no matter what the online zealots say), and his call for the renewal of social democra I have not always been a fan of Judt's politics. The 'fidelity to facts' is a classic right-wing trope against the 'ideological' interpretations of left historians. There is some of that here as well, but interestingly, Judt is at his best as a critic. The utter demolition of Norman Davies' Europe: A History is simply the most enjoyable book review I have ever read. Judt is extremely solid on Israel/Palestine (no matter what the online zealots say), and his call for the renewal of social democracy is compelling (although it does not solve the inherent problems of capitalism, of course). Judt praises when he thinks it's worth it, and doesn't hold back when he thinks something is wrong. One would wish more of that from academics. To me, Tony Judt was one of the late 20th century's great public intellectuals. His interests were broad and varied, and the insights he brought to the important issues of history were legend. He could be very critical and sharp (see his essay on Norman Davies' History of Europe), and at the same time tremendously caring and sympathetic (see his book Ill Fares the Land). The late essays he wrote on train travel, published in the NYRB, are deeply touching and, dare I say, almost romantic. variety of topics. I highly recommend. An interesting read. It was something I probably wouldn't have picked up on my own. I read some things I never knew about. After six months on and off reading, finally finished this outstanding collection of essays. Thought provoking and perspective broadening.